What do the numbers on the bottom of my plastic bottles mean? 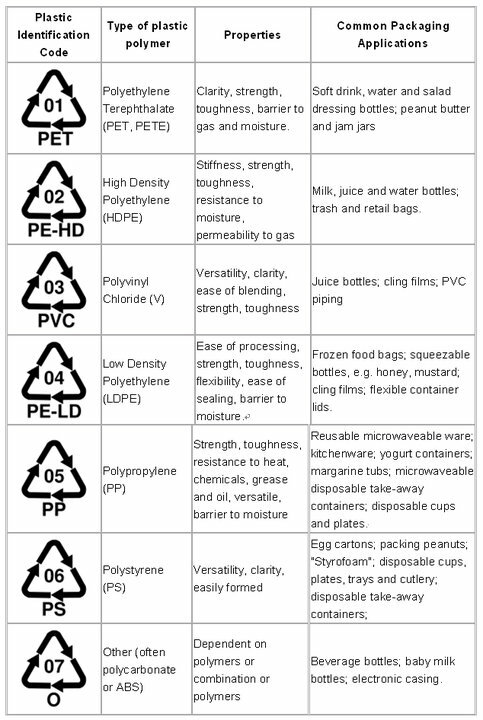 Polyethylene Terephthalate (PET, PETE). PET is clear, tough, and has good gas and moisture barrier properties. Commonly used in soft drink bottles and many injection molded consumer product containers. Other applications include strapping and both food and non-food containers. Cleaned, recycled PET flakes and pellets are in great demand for spinning fiber for carpet yarns, producing fiberfill and geo-textiles. Nickname: Polyester. USES: Plastic soft drink, water, sports drink, beer, mouthwash, catsup and salad dressing bottles. Peanut butter, pickle, jelly and jam jars. Ovenable film and ovenable prepared food trays. Potential problems: PET/PETE degrades with use, and wrinkled surfaces can host germs–as can backwash. PET/PETE bottles can contain trace amount of Bisphenol A (BPA), a synthetic chemical that interferes with the body’s natural hormonal messaging system. BPA has been linked to breast and uterine cancer, an increased risk of miscarriage, and decreased testosterone levels. his problem is amplified when the container is filled with hot liquids or exposed to high heat such as being left in a car. High Density Polyethylene (HDPE). HDPE is used to make bottles for milk, juice, water and laundry products. Unpigmented bottles are translucent, have good barrier properties and stiffness, and are well suited to packaging products with a short shelf life such as milk. Because HDPE has good chemical resistance, it is used for packaging many household and industrial chemicals such as detergents and bleach. Pigmented HDPE bottles have better stress crack resistance than unpigmented HDPE bottles. USES: Milk, water, juice, cosmetic, shampoo, dish and laundry detergent bottles; yogurt and margarine tubs; cereal box liners; grocery, trash and retail bags. Potential Problems: No known problems. Vinyl (Polyvinyl Chloride or PVC): In addition to its stable physical properties, PVC has excellent chemical resistance, good weatherability, flow characteristics and stable electrical properties. The diverse slate of vinyl products can be broadly divided into rigid and flexible materials. Bottles and packaging sheet are major rigid markets, but it is also widely used in the construction market for such applications as pipes and fittings, siding, carpet backing and windows. Flexible vinyl is used in wire and cable insulation, film and sheet, floor coverings synthetic leather products, coatings, blood bags, medical tubing and many other applications. USES: Clear food and non-food packaging, medical tubing, wire and cable insulation, film and sheet, construction products such as pipes, fittings, siding, floor tiles, carpet backing and window frames. Potential Problems: Contains numerous toxic chemicals called adipates and phthalates (“plasticizers”), which are used to soften brittle PVC into a more flexible form. PVC is commonly used to package foods and liquids, ubiquitous in children’s toys and teethers, plumbing and building materials, and in everything from cosmetics to shower curtains. Traces of these chemicals can leach out of PVC when it comes into contact with food. Vinyl chloride (the VC in PVC), as a known human carcinogen. The European Union has banned the use of DEHP (di-2-ethylhexyl phthalate), the most widely used plasticizer in PVC, and in children’s toys. USES: Dry cleaning, bread and frozen food bags, squeezable bottles, e.g. honey, mustard. Polypropylene (PP). Polypropylene has good chemical resistance, is strong, and has a high melting point making it good for hot-fill liquids. PP is found in flexible and rigid packaging to fibers and large molded parts for automotive and consumer products. USES: Catsup bottles, yogurt containers and margarine tubs, medicine bottles. Polystyrene (PS). Polystyrene is a versatile plastic that can be rigid or foamed. General purpose polystyrene is clear, hard and brittle. It has a relatively low melting point. Typical applications include protective packaging, containers, lids, cups, bottles and trays. USES: Compact disc jackets, food service applications, grocery store meat trays, egg cartons, aspirin bottles, cups, plates, cutlery. Other. Use of this code indicates that the package in question is made with a resin other than the six listed above, or is made of more than one resin listed above, and used in a multi-layer combination. Includes polycarbonate. USES: Three and five gallon reusable water bottles, some citrus juice and catsup bottles. Potential Problems: Studies show polycarbonates can also leach the potentially harmful synthetic hormone Bisphenol A (BPA). This problem is amplified when the container is filled with hot liquids or exposed to high heat such as being left in a car. Thanks to the good folks at h2no.org for this very useful information!!! ← Are Multi-Pure Water Filters Superior to Other Water Filters?